Coal fly ash is one of the residues generated in the combustion of coal, and generally captured from the coal-fired power stations. Depending upon the source and makeup of the coal being burned, the components of fly ash vary considerably, but all coal fly ash includes substantial amounts of silicon dioxide (both amorphous and crystalline) and calcium oxide, which is commonly used to supplement Portland cement in concrete production so that both technological and economic benefits can be generated, and it is increasingly being used in the synthesis of geopolymers and zeolites. 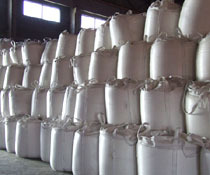 Xiamen Bentonite International Corporation (XBIC) is a leading supplier of the coal fly ash, has established long-term partnerships with several coal-fired power stations in China, and collect the coal fly ash in bulk tanker, offload them in silos in our ash station and then refill the coal fly ash in jumbo bags of around 1400kgs for distribution to our customers. Our annual output of Hammer ® – coal fly ash is nearly 300,000mt, which is produced in conformance with the ASTM C618 specification, and the quality is controlled and monitored throughout the entire production process to ensure that it meets or exceeds the specification requirements. Hammer ® - coal fly ash is supplied in uv-proof and aging-resistant jumbo bag according to GB/T10454 and EN ISO 21898, which is suitable to be stored in a severe environment for long term. ● Packed in 1400kgs jumbo pp bag with pe liner.